Janet is influenced by abstract works and her approach is to piece and patch fabric. The joins form lines which can represent boundaries separating one area from another. They often form geometric shapes: lines, shapes and their relationship to each other are important. Stitching may be applied to characterise a boundary, for mark making and to create concentrated areas of interest. The two ceramic pieces chosen by Janet are sources of shapes and patterns, provided both by different orientations of the objects and markings on the pieces themselves. Interesting shapes are created when viewing the jug by Walter Keeler from different angles. The concentric pattern on each side of the jug (his signature mark) contrasts well with the mottled salt glazing. The bowl, a symmetrically shaped object, was probably made by a Japanese ceramicist but decorated by Bernard Leach; the markings on it suggest stitched patterns. While assembling shapes of these two objects, some of Ben Nicholson’s still life work came to mind; these feature jugs, mugs and bowls, and often contain patterned effects similar to those on the decorated bowl. Nicholson and Leach were both significant artists/practitioners in St Ives during the 1920s. 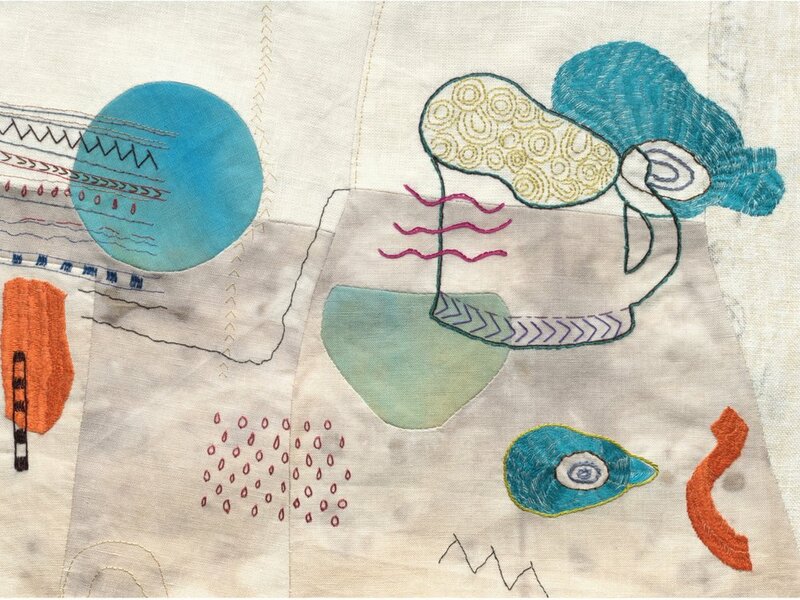 Janet’s abstract still life was created by piecing linen, and stitching areas and lines mainly with silk thread. Patterns have become detached from the original objects and some colours do not necessarily relate to the more subdued hues of the ceramics.